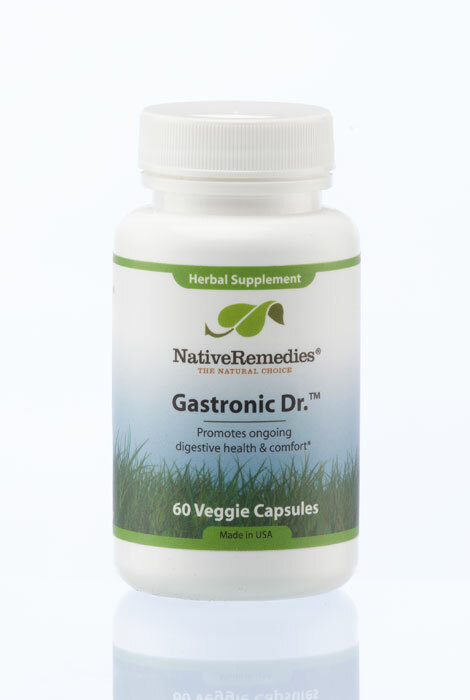 Naturally supporting healthy digestion, NativeRemedies® Gastronic Dr.™ helps enhance your comfort, especially after meals. With therapeutic dosages of Chamomile, Meadowsweet, Slippery Elm and Sutherlandia Frutescens, the safe, effective 100% herbal supplement helps balance and support the entire digestive system and stomach lining—which in turn, enhances healthy absorption of nutrients. This digestive supplement also works to maintain the natural balance of essential organisms (like probiotics) in the digestive tract, further promoting easy, healthy digestion. Includes 60 capsules. Gastronic Dr. is a 100% herbal formula and contains the following ingredients in therapeutic dosage: Chamomile, Meadowsweet, Slippery elm, Sutherlandia frutescens. German chamomile (Matricaria recutita) is an excellent supportive supplement for digestive health. Meadowsweet (Filipendula ulmaria) helps to support the health of the stomach lining and digestive mucosa, also promoting healthy levels of stomach acid and digestive secretions. It has been researched extensively for its ability to support stomach health. Slippery elm (Ulmus fulva) is known for its bark, which is rich in trace minerals, manganese, iodine, protein and soothing mucilage. It is a very highly respected herb in naturopathic circles and is regularly used in holistic remedies to support the health of the digestive tract. Cancer bush (Sutherlandia frutescens) has been used to promote digestive health and as a supportive systemic tonic. Sutherlandia contains a number of highly active compounds, including pinitol, L-canavanine and the amino acid, GABA. L-canavanine is a strong L-argine antagonist (Swaffer et al. 1995, Crooks and Rosenthal, 1994, Ostlund and Sherman, 1996. ).